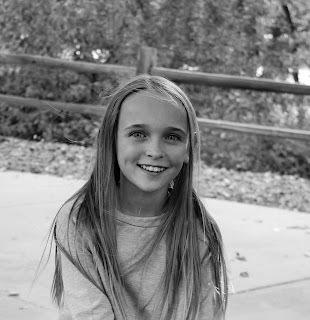 This precious girl turned 11 and I am just getting around to sharing... Whoa. I need to manage my time a little better, before things get really out of hand! Oh my heart, she is just so pretty among other things of course! This girls, oh where to start?! She is ALWAYS up for an adventure! Climb it, drive it, ride it, try it. She is my little dare devil! She will try anything once. I love this about you, you my friend are brave and uninhibited. I wish I could be more like this. Not caring what anything thinks or says, just enjoying every experience for what it is. You are a skiing expert, you tried boogie boarding in the ocean this year and have recently been inquiring about bungee jumping and sky diving, yipes! She is my photogenic girl, she will stop drop and pose and look great doing it! The silliness doesn't ever stop, you crack me and daddy up daily with your silly stories, jokes and insights about life. Your parodies of songs are to DIE for! I love how you are so musical and clever. Speaking of musical, you certainly didn't get that from me, but you have such a natural talent for sounds and we are so proud that you were recommended for a music learning plan for gifted kids at school, I can't wait to see what you do! You are currently so low maintenance I don't even know how to be your mom sometimes. You are self sufficient at so many things! You are pretty easy going and it drives me a little bananas that you don't want to brush your hair or dress up super fancy right now, but that's okay, maybe I had my fun with that while you were small and impressionable. But I hope that you always put your best foot forward and above all, be YOU and not what others want you to be. Lord knows you are too strong willed for that nonsense! You never run out of ideas to keep you and Kellen entertained. This creativity, again, I have no idea where it comes from, but who makes ninja costumes and sneaks around the house all day?Why, you my dear! This year you got to meet your idol Sabrina Carpenter and it was so sweet to see how excited you were! You have such a special bond with your grandparents, well all of your family really! You are so loved by your family! Speaking of bonds, even though you don't always show it, you love your brother and are usually so sweet to him. Little brothers are tough, I get it, but you are patient and kind and I pray that you always keep that relationship with Kellen! You are fierce! Even though you are little and that's a-okay, you pack a punch with your sass and personality. You are such a wonderfully unique and precious girl and I am so thankful that God made you just the way you are! You are crazy smart and love books and writing. You love and are truly so talented at music! You have the biggest heart for people who have less and I think your 3 children around the globe that you want to help are a testament to your sense of injustice and fairness! You stand up for people who can't defend themselves and I can't wait to see how God uses you to help and touch others. I hope you never ever lose your sense of wanting to help and being someone important. I love you, hot stuff! Happy 11! Halloween and how can it be November? I blinked and we are already 1/3 of the way through the 11th month of the year, from here on out, it's crazy town USA with birthdays, the holidays and the general shenanigans! It was freezing this year, cold and short but fun! They did most of the carving and cleaning this year, so it was more productive and far less work, which is what you always want as a parent! Not too shabby for these two! At school we had our annual monster party! It was a blast! The most mismatched pair on the block. I had Kellen all convinced to be captain America or Spiderman and he went rogue and decided to be a lion. Which is super fitting given his obsession with lions, but these two things just don't quite go together! We made a quick pit stop at Grandma and Grandpas's house to visit their neighbors and take some pictures with little monkey we found! Pay day! Another great Halloween in the books!